Procellaria glacialis Linnaeus, 1761, within the Arctic Circle (Spitsbergen). 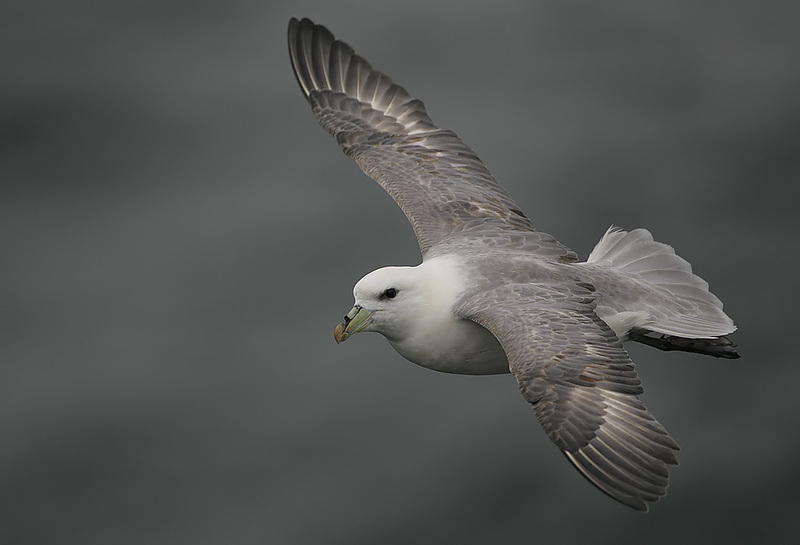 English: Arctic fulmar; French: Fulmar borйal; German: Eissturmvogel; Spanish: Fulmar Boreal. 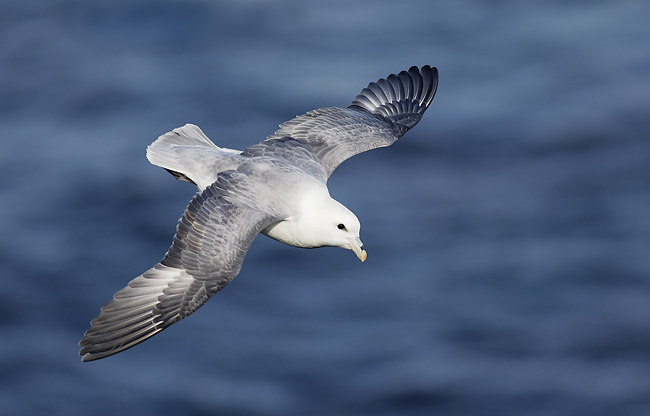 With a wingspan of 40.2–44.1 in (102–112 cm), white head, and gray upper body, northern fulmars resemble gulls, but their wings are broader and the neck is thicker. Lighter morphs are more common in Atlantic, darker morphs in Pacific. Northern Atlantic and Pacific oceans, has spread southward over much of the Atlantic Ocean. Winters farther south. Marine, especially colder waters of the Northern Hemisphere. More aggressive in vomiting habits than other procellariids. Stiff wings held out straight from body help to distinguish them from gulls. Feed on fish, squid, plankton, and fishing refuse. Feeds in flocks, frequently behind fishing boats. Will scavenge on carrion. Breeding season begins in May. 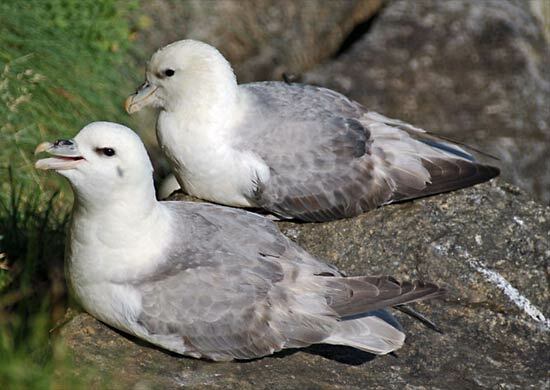 The single white egg is incubated 47–53 days; the white to dark gray chick is brooded for 2 weeks; fledging after 46–53 days. Nests colonially on cliff ledges and on level ground, and has expanded to buildings and rooftops. Not threatened. 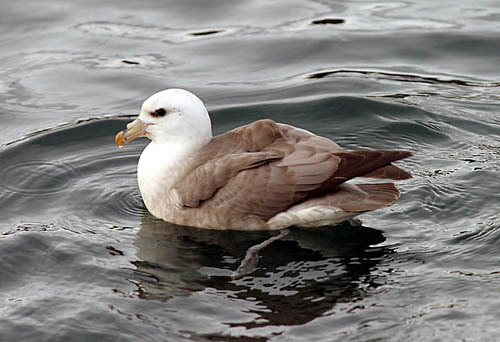 One of few seabirds to increase in numbers and range since 1800. Expansion may be due to food from fishing ship discards or to changing oceanographic conditions. The dependence on fishing ships presents an interesting conservation problem. 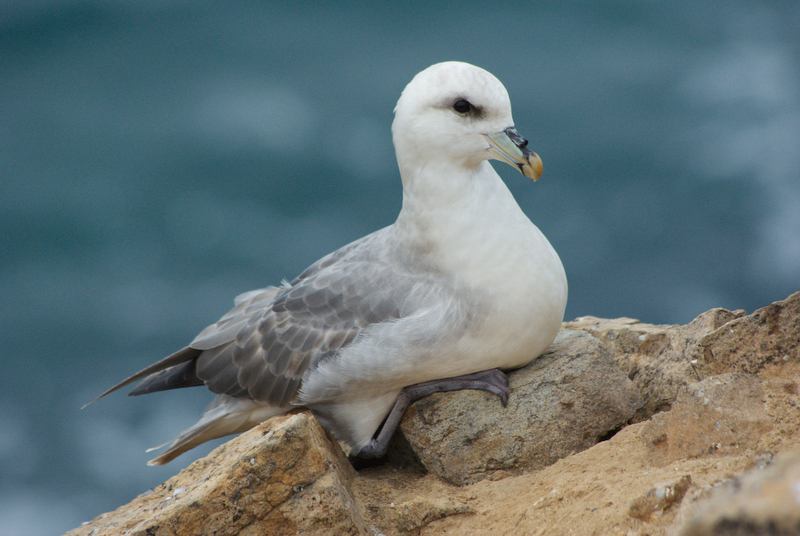 If ships clean up their refuse, then fulmars may be pushed to feed elsewhere, potentially on smaller birds. Once hunted for food. Now may be anthropophilic, following fishing ships for food.